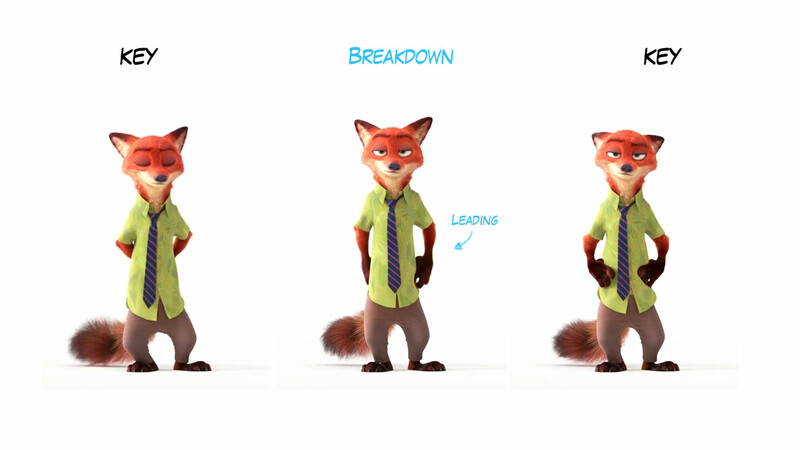 I thought I’d continue looking at breakdowns, this time using the Zootopia teaser as an example. To see a larger version, just click on the images. 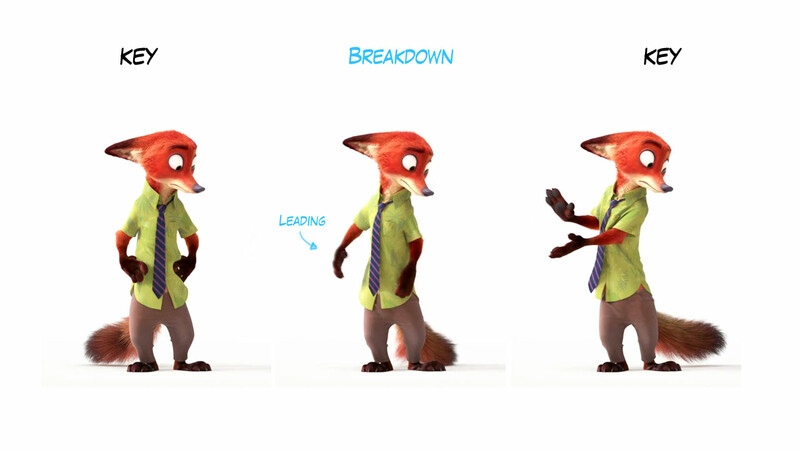 When studying the face we can see the animators have used a variety of principles on the breakdowns. 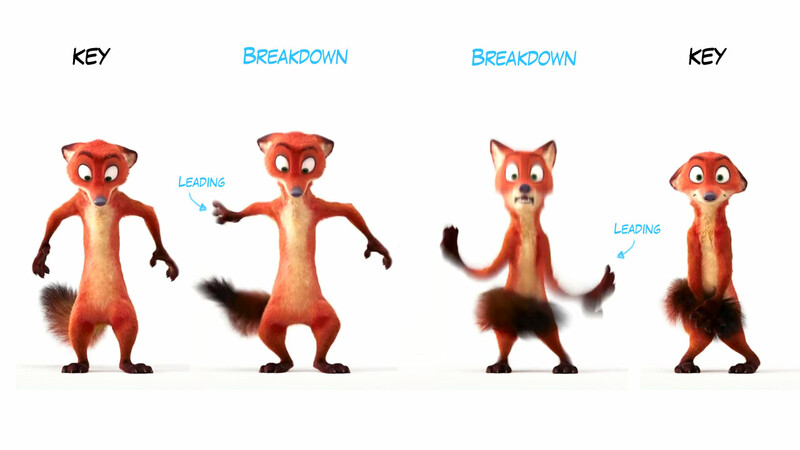 When looking at the keys on the hands we can see they’re often in a similar position to each other, but when breaking down the movements the animators have been careful to differentiate the movement. Notice how one hand leads the other into the next pose, this will cause the spacing and general feel of each hand to be different. This entry was posted in Break down on November 16, 2015 by Tim. I’m confused though about some of the breakdown labels, from what I’ve been taught anticipation poses are usually labelled as extremes as they define the action going one way and then the other, a breakdown only defines the arcs and motion between an extreme. It’s easy to see why the term can be misunderstood, every time we mark a value in Maya/AfterFX/whatever- it’s called a key! “Keys” can be loosely defined as significant poses- thus Key poses. They can include extremes, golden poses, contacts, even breakdowns and inbetweens. Tim is spot on in his analysis of this section- there’s a lot to learn here. The shots are rich with varied arcs, overshoots, ease-ins and the like. Thanks Josh, yeah you’re right there, anticipations and overshoots are extremes. I don’t think animation terms are so strictly defined though. In my way of thinking a breakdown is describing the way something moves from one key to the next. Another person might say those anticipations and overhsoots are secondary breakdowns, something between the key and the primary breakdown. If it’s confusing people I’ll change the post, but to be honest I’ve rarely heard the word “extremes” used outside of animation school. Awesome examples, and it totally start to make sense. Do you have any examples explaining “Inbetweens” fitting into the key and Breakdown poses? Thanks Eric. Yeah I’d like to do this topic more justice, even when re-reading this post I need to look super closely to see what I was referring to. A post on inbetweens sounds like a great idea. I’ll have a think about what could be said about the topic.